Bound for the Bay Area from Santa Cruz, I took the Highway 17 Express bus from the Santa Cruz Metro Center to Diridon Station in San Jose. From there I took the Caltrain (above) to San Francisco. 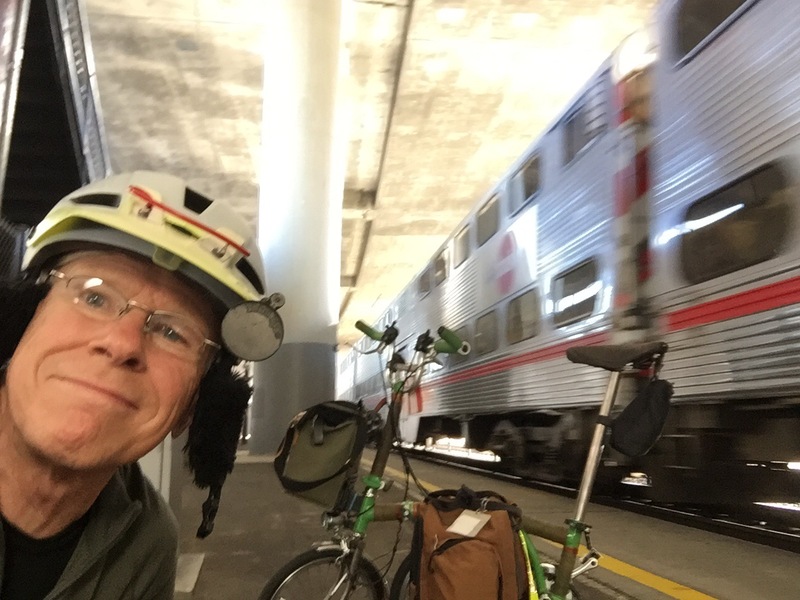 This is a well established commuter rail system that serves many of the penninsula’s cities from San Jose to San Francisco. It’s been in operation since 1987, is 77 miles long, has 32 stations and sees about 58000 boardings a day. 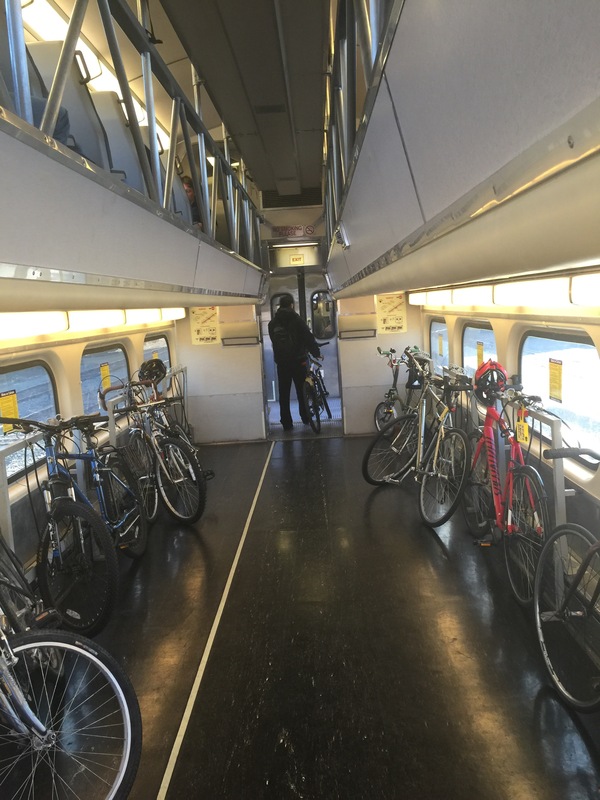 I had been hearing about the bike cars on Caltrain for years but this was my first chance to use them. 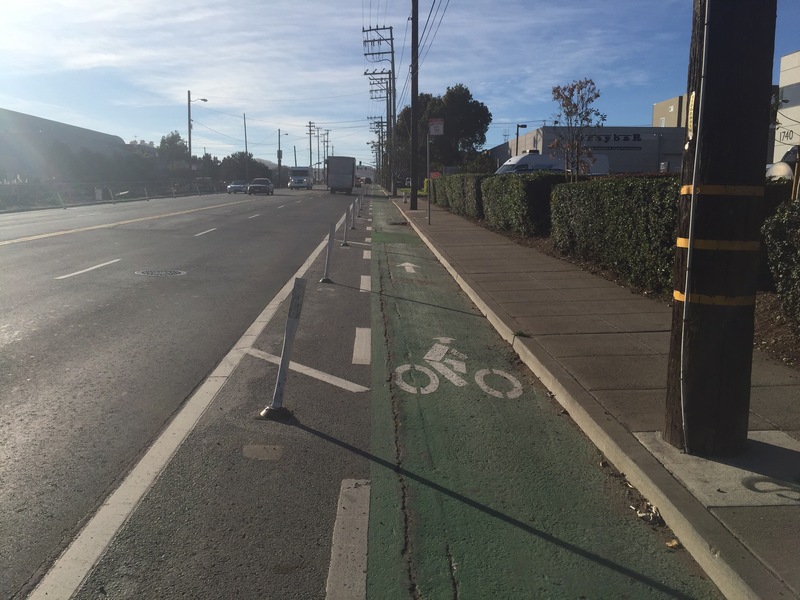 Initially, they just removed a few seats to make room for bikes. They eventually dedicated a whole car to bikes, then two cars and now have custom two-level cars for bikes and their owners. 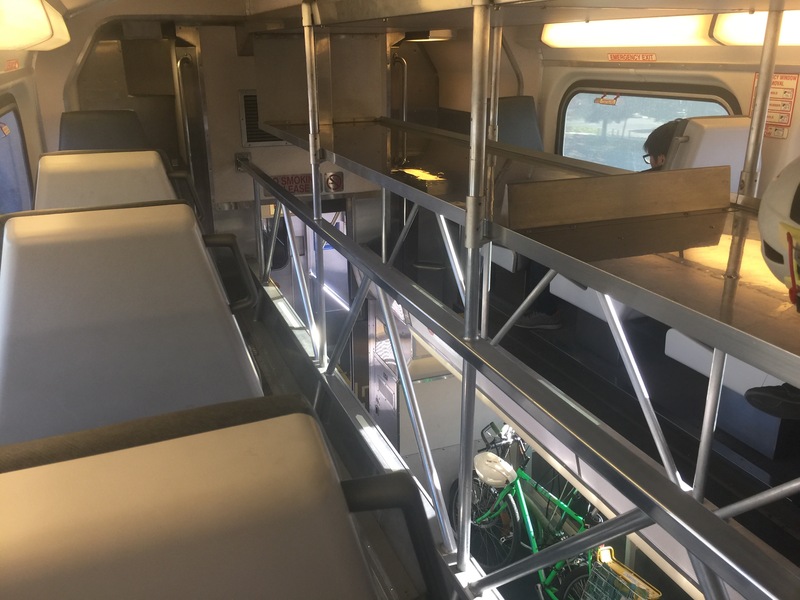 You can see the seating area above the bike storage space in the above photo (there are about 20 seats on the upper level and eight on the bike level). From the upper level you can keep an eye on your bike (look closely in above photo). There’s a capacious luggage tray between the two rows of single seats. Very clever use of space. 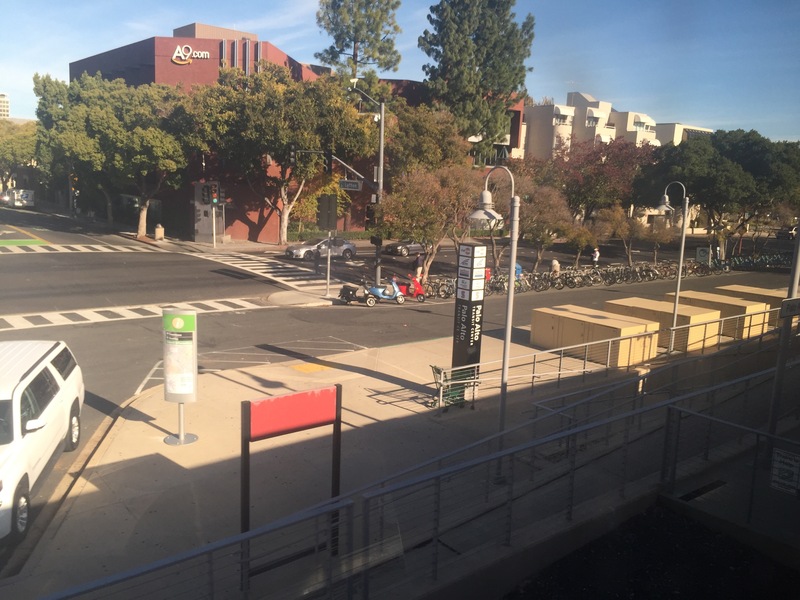 Out the window as we went by the Palo Alto station, below, look closely and you can see a lot of bike parking, including lockers. Sure hope we’re able to add more bike parking to the Expo Line stations if a need like this arises over time. Google bike directions indicated Cesar Chavez (below) was a good route to get from the 22nd St. station to my destination. 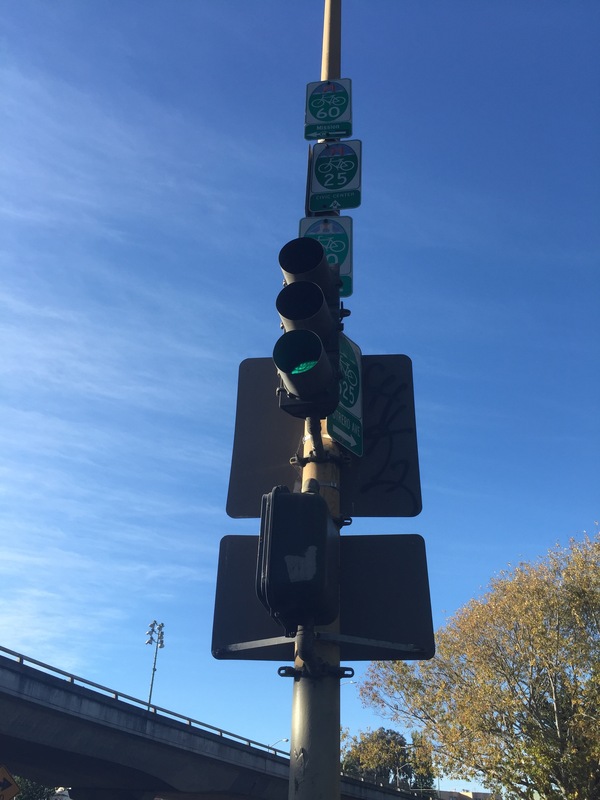 Sure enough, it had buffered bike lanes in the first stretch, an extra margin of safety for cyclists in this industrial area with lots of trucks. 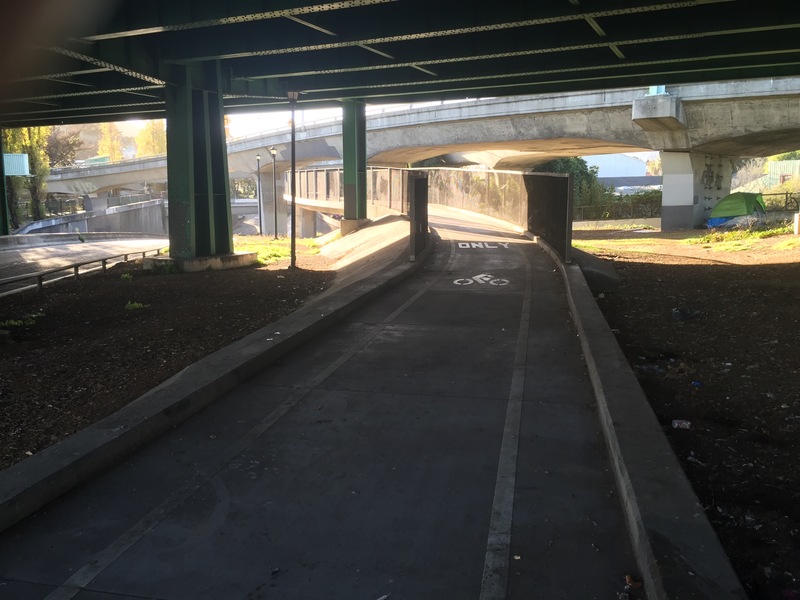 Below, a separated bike path and bridge provided a safe undercrossing of the 101 freeway, a welcome facility for what is often a treacherous place for cyclists to navigate. Above, extensive wayfinding signage at an important fork in the road, a bit hard to see though. 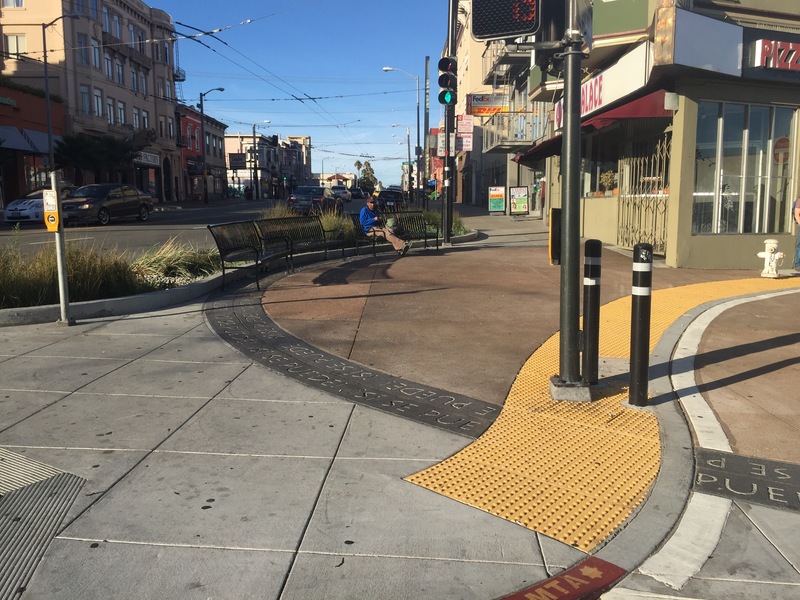 Nice seating in this generous curb bulbout at the foot of Van Ness at Cesar Chavez. I needed to use my lowest gears but made it to my friend Paul’s in Noe Valley. 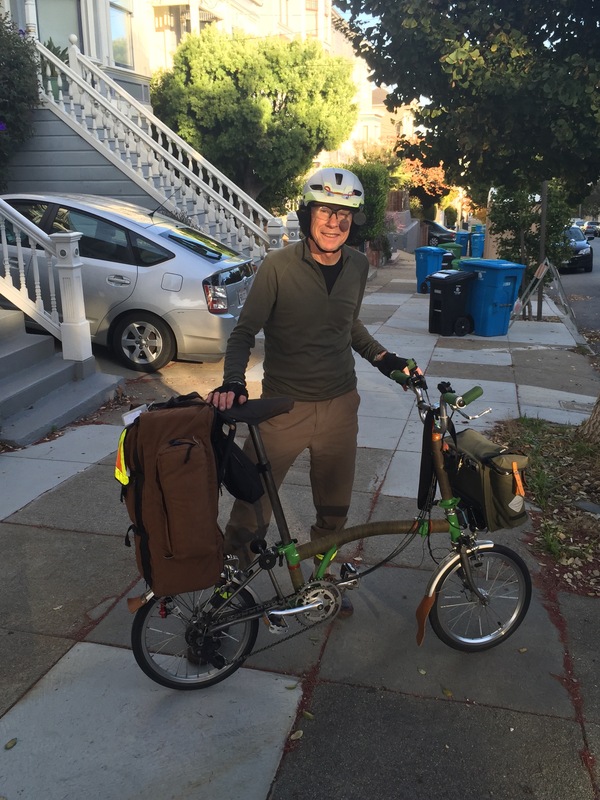 Tomorrow I visit the folks at Bike East Bay. Pullman Company built Southern Pacific Railroad (SP) a full order of Harriman Lines Common Standard Wide Window Steel coaches (delivered 1909 to 1912). Many of the cars were used in San Francisco to San Jose commute service. The commute train has had a long history before the advent Caltrain.